The online registration system for the 2014 Annual Meetings is now available. Click here to register. Politics has a massive impact on economic outcomes. States redistribute wealth, make up for market failures, and enact policies that can devastate an economy or promote long run growth. They also provide the essential public goods of security, the rule of law, and a means of exchange. Without these, life is brutal and trade little more than barter. But what determines the laws and regulations that states adopt and the public goods they furnish? How do states arise in the first place and gain the capacity to tax? What shapes the changes in their policies and their expenditures over time? Can we distinguish the political incentives that encourage good policies rather than tragic ones? Do the answers lie with endowments, the distribution of wealth, or deeply rooted institutions? Or are they to be sought in culture and the guiding hand of history? For the complete Call for Papers, see: http://eh.net/eha/call-for-papers/, which also includes information on travel options to Columbus; or contact Meetings Coordinator Jari Eloranta at elorantaj@appstate.edu. NOTE! Deadline for submitting proposals has ended! Graduate students interested in attending the annual meeting but not participating in the poster session are eligible, depending on funding availability, for up to three nights’ complimentary hotel room (double occupancy, shared with another graduate student). Send requests to the email addresses listed above. Applicants must be members of the Association. Deadline: July 5, 2014. Awards announced by July 26, 2014. Questions about the poster session should be directed to Professor John Wallis, chair of the program committee (wallis@econ.umd.edu). To ease travel complications, we will provide the poster board. We intend to purchase Hunt Sturdy BoardTM QuickStick(c) Foamboard 20″ x 30″, White, (Office Max Item #11067061) OR something very similar. It claims to have “pressure sensitive adhesive.” Just in case, we will also bring tacks and tape. Ph.D. recipients selected for the dissertation session will receive a travel subsidy. See procedures for applying for the Nevins or Gerschenkron prizes. DEADLINE FOR POSTMARKED ENTRIES: The deadline has now PASSED. No more entries will be accepted. THE CUTOFF DATE FOR RESERVATIONS IS AUGUST 20! The conference is hotel is the Renaissance Downtown Hotel located in the heart of Columbus, Ohio. The conference rate for EHA attendees is $149 per night. 1. By booking online through the following link. Please note the link is case sensitive. 2. By calling Renaissance Enhanced Group Reservations at 877-901-6632. You can also call the property directly at (614)228-5050 and be connected. 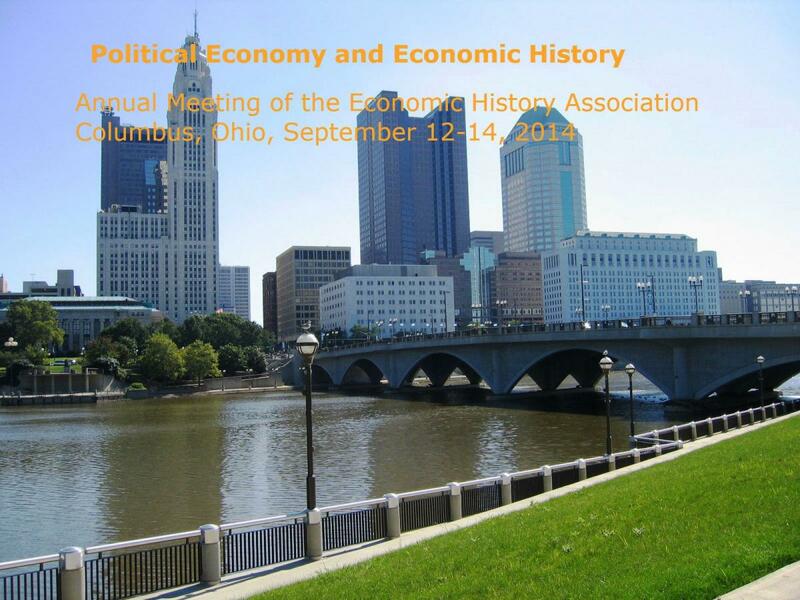 Please be sure to ask for Passkey Reservations and request to book rooms with the Economic History Association 2014 Annual Conference to receive the discounted group rate of $149.